"I never think. That's what makes me a good cop." 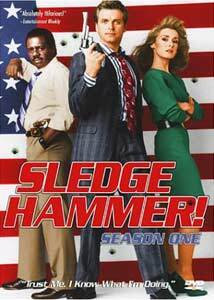 While there have been numerous television comedies based on police work, none of them have been quite so over-the-top as the notorious Sledge Hammer! Managing to survive for two seasons despite consistently wretched ratings, the first season of this hilarious satire now bludgeons its way onto DVD thanks to Anchor Bay. Essentially a satire of the Dirty Harry series, as well as all the other rogue cop dramas that followed in its footsteps, the series follows trigger-happy San Francisco police inspector Sledge Hammer (David Rasche) and his partner Detective Dori Doreau (Anne-Marie Martin) as Hammer lays waste to the criminal element and everything else that happens to get into his way. Long-suffering Captain Trunk (Harrison Page) is forever suspending Hammer for one fracas or another, yet through a combination of berserk gunslinging attitude and inane clumsiness, Hammer manages to somehow save the day, usually. But one can tell disaster is impending whenever Hammer utters his trademark phrase, "Trust me, I know what I'm doing." Rasche is terrific in the lead role, playing it deadly serious even as he does the most bizarre and outr� things. Physically, it works great, with widely-set vacant blue eyes that make one wonder if he's quite all there. Adopting many of the gritted-teeth mannerisms of Harry Callaghan, Rasche talks to his gun and credibly plays the demented enforcer of the law to a T, oblivious of everything else going on around him. Martin makes for an excellent straight woman, and when called upon can do both physical action and comedy. Harrison Page does a mean slow burn and invariably ends up screaming with rage over Hammer's latest antics, resulting in one of the few performances that can rival the fuming intensity of Herbert Lom in the Pink Panther sequels. The pilot episode, directed by Martha Coolidge, sets the characters up unforgettably, including the notorious sequence in which Hammer blows up a 25-story building to nail a sniper. Adding credibility to the pilot is the presence of John Vernon as the mayor of San Francisco, just as he had been in some of the Dirty Harry films. Things start off with a bang in Hammer Gets Nailed, as a reporter ride-along with Sledge ends up resulting in half the force being laid off due to his antics. The film Witness gets skewered in Witless, as a mob contract out on Sledge results in his going into hiding in an Amish community. The unforgettable All Shook Up finds Hammer infiltrating a school for Elvis impersonators after fifteen impersonators are murdered. When the producers erroneously thought that the series would not be picked up for a second season, they let out all the stops for the last three episodes, making them brutally funny and truly inspired in their combination of wordplay, satire, and childish slapstick. Comrade Hammer opens with a North by Northwest satire, then Hammer must make sure a Russian scientist makes it safely to a conference while aboard a train packed with Russian spies. Jagged Sledge answers the question of what might happen if Sledge were to find himself on trial for murder after brutalizing his suspects. And the amazing The Spa Who Loved Me features bikini-clad terrorists who steal a nuclear warhead and threaten to destroy the city, while the cliffhanger, never quite meant to be answered, finds Sledge attempting to disarm the warhead as he says, "Trust me, I know what I'm doing." How many other sitcoms dare to end a season with thermonuclear destruction? Although there's a danger with such a satire becoming a one-joke piece of monotony, there's sufficient inventiveness here that one can watch quite a few episodes without getting tired of them. It helps that the character interplay is so well-developed, giving a depth to the program beyond just the gags. While the episodes written by creator Alan Spencer are quite the best, there aren't more than one or two clunkers in the bunch, such as To Sledge with Love. That's a pretty good ratio for just about any series, and it's no wonder that Sledge Hammer has achieved cult status. Image Transfer Review: The original full-frame picture is mediocre, mainly because it seems to have been taken from a video source. The picture is quite soft, with reds tending to bleed. The picture also tends to be grainy, with some aliasing visible, but of course 1980s television shows were never meant to be watched on today's large screens. If the source elements are indeed video rather than film, this is probably as good as this program is likely to ever look. It's nonetheless quite watchable. Audio Transfer Review: The Dolby Surround English track sounds quite decent, especially since it has the laugh track stripped off. There's plenty of surround activity, especially from Danny Elfman's score, and the music has excellent range and presence. Bass is pronounced, and little noise or hiss is audible. Extras Review: Anchor Bay loads up this four-disc set with quite a few high quality extras. Creator/producer Alan Spencer provides commentary for four of the most notable episodes, and he's quite funny in his recollections. He does manage to say the word, "jejune" more than any other living being, however. The season finale commentary is interrupted appropriately enough by an earthquake, a thematic punctuation that was clearly too good to delete. The episodes have a useful 'play all' button allowing for nonstop Sledge goodness, and there's an enclosed dossier with extensive liner notes regarding the inception and reception of the show. A new documentary Go Ahead, Make Me Laugh! (31m:42s) provides interview footage with all of the principals. A caution for new viewers, however, that in the last five minutes or so the resolution of the cliffhanger is discussed, so if you don't want to be spoiled, stop watching when they start to talk about the season finale. But there's more. The original, much longer, unaired pilot with a different ending is included, as well as the electronic presskit from 1986 and five TV spots warning that Sledge Hammer is coming (plus the "Sledge Hammer will be right back" bumper. A still gallery includes over three dozen stills, 23 promos (including the covers of the short-lived comic book adaptation), and 29 pages of designs and storyboards. There's also an audio tape of Alan Spencer begging critics to watch the program, which was going to be up against the dual juggernauts of Dallas and Miami Vice (and who would have thought this program would beat them both to DVD?). Finally, there are PDF scripts of both the ABC version of the pilot and the unaccepted HBO version (which may not be suitable for younger readers). The only serious shortcomings are the lack of chapters within episodes and the omission of subtitles or closed captioning. Now, bring on Season Two! The cult favorite series comes to DVD in a fine package that combines a good transfer of problematic elements with copious extras. Trust me. I know what I'm doing.